A few hours ago, on Instagram’s most famous egg on the planet account, appeared image number five… and the most interesting image so far. After beating Kylie Jenner daughter’s image for the most-liked Instagram photo ever (the image has now more than 52 million likes) last month… the famous egg went viral on the internet. Everyone starts to wonder who is the brand behind this Instagram viral marketing campaign and what they really want to promote with this Instagram account… in the end? From the last Instagram’s caption post, we found that Hulu is the first brand that made a sponsorship deal with the World Record Egg (the deal is evaluated of a couple million dollars but nothing official has been announced yet). So… the Instagram World Record Egg’s Secret will finally be revealed after Super Bowl LIII. What brand/product/service do you believe will be revealed from this World Record Egg’s Instagram account tomorrow, after Super Bowl LIII? 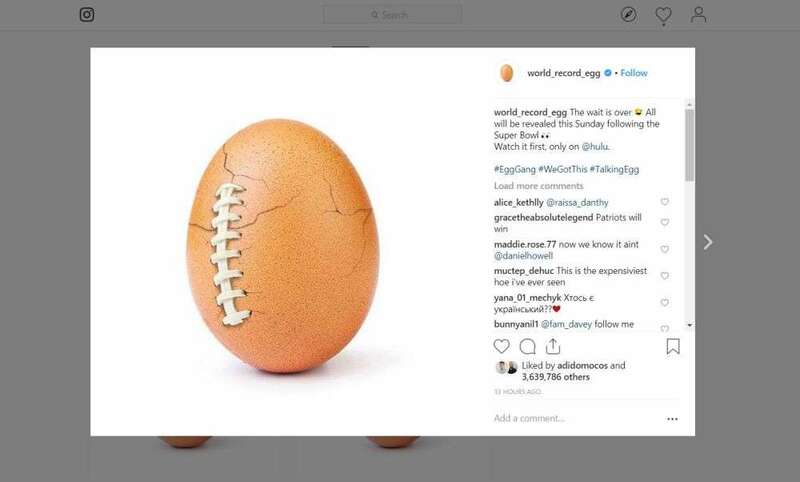 Do you think the big announcement about the brand behind Instagram World Record Egg’s account will be made tomorrow during the Super Bowl LIII game or the days after? See also: How to Make Money off Instagram in 2019?